GORHAM—After their visitors, the Falcons, posted a huge first half on Friday afternoon, May 18, the Rams could’ve cashed it in, called it a day. Instead, they responded with their own huge half, the second half: Bridget Rossingol hashed four for the Rams in the downhill stretch, leading a comeback effort that almost succeeded. Almost, but not quite: Chalk this one in Freeport’s win column, 10-8. Ram Carson Battaglia fires inward. Katie Kutzer approaches on the attack for the Rams. Freshman Gracie Forgues saw a good deal of field time for the Rams. Haley Keeffe wheels away from a Freeport opponent. Kacie Walton played superb defense for the Rams on Friday. Peyton Morton drives forward on the attack for Gorham. Gorhamite Sarah Walker clashes with a Freeporter. 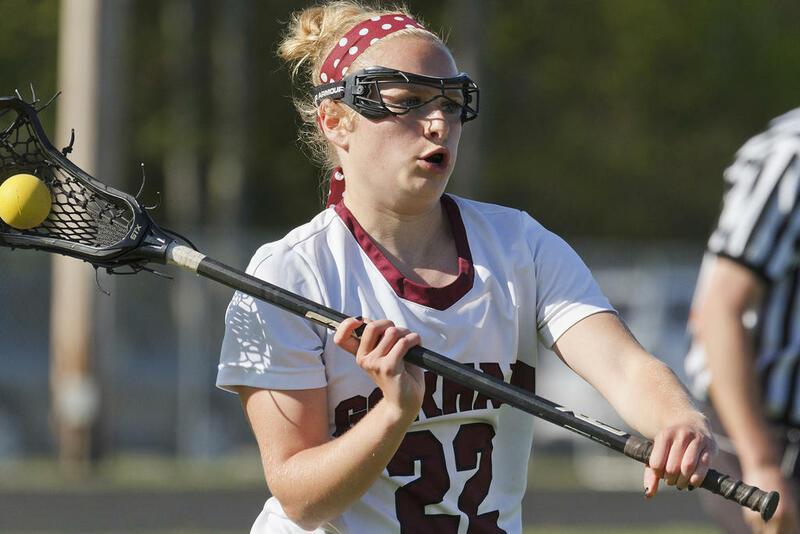 Bridget Rossingol sparked the Gorham offense in the second half. Jillian Nichols faces off with a Freeport opponent. Hailey Morrill races a Freeport opponent upfield. Gorhamite Molly Barr cuts through the action. Faith Dillon carries for Gorham. Paige Hume guards the Gorham net.